Your two year old is crazy busy getting into just about everything. And you might just feel like ripping your hair out… …because you just don’t know what to do! And then you decide to try to do a craft. You spend hours searching for a craft to do and then more time going to store after store to find the right supplies. And then even longer prepping them… and you’re exhausted before you even invite your two year old to join you. But its fun…. for about 5 minutes. And did the craft turn out like it was shown? Heck no! This is definitely a Pinterest fail. And you get upset that the craft didn’t turn out and it just ends up becoming a huge fight and no one is having fun. Where in there did the memories get created? 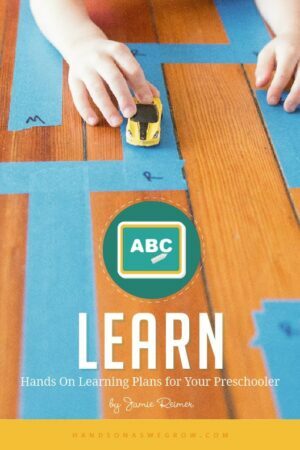 Hint: It was in the 5 minutes your two year old was having a blast creating that craft. And had nothing to do with how it turned out. What if I told you I have a perfect solution that doesn’t cost you hours of prepping activities and crafts? 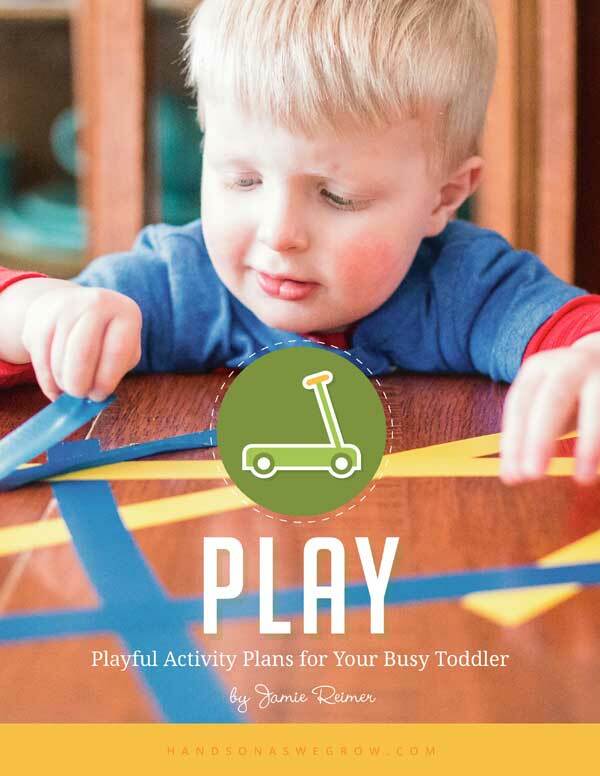 These are 35 hand-chosen activities that you can actually do with your toddler. You’ll be guided on how to find that extra 15 minutes (that you don’t have) to make time for the most important part of your life: your family. 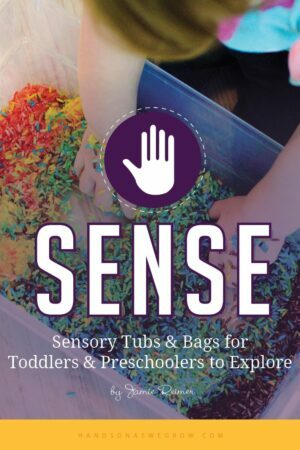 Make it Easy to Have Fun with Your Toddler! They are the simplest of activities that use the supplies you have. An entire week of activities (plus a supply list) is on one sheet of paper, making it easy to print out and pin it up for the week. That also means that each activity is explained in 2-3 short sentences. 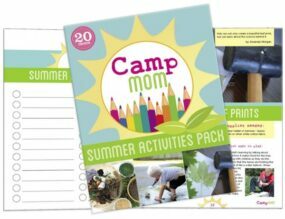 There are printable activities, planners, and tips on how to do these activities! PLAY has five printable weeks of 35 activities to do with your child. These activities are the heart of the eBooks and are what sets these apart. Having a planned week of simple (doable) activities ready for you to do with your preschooler, makes it super easy to actually do them! By having a simple place to come back and check off that you did the activities gives you a sense of accomplishment. That little push you need to help you go ahead and have some fun with the kids! 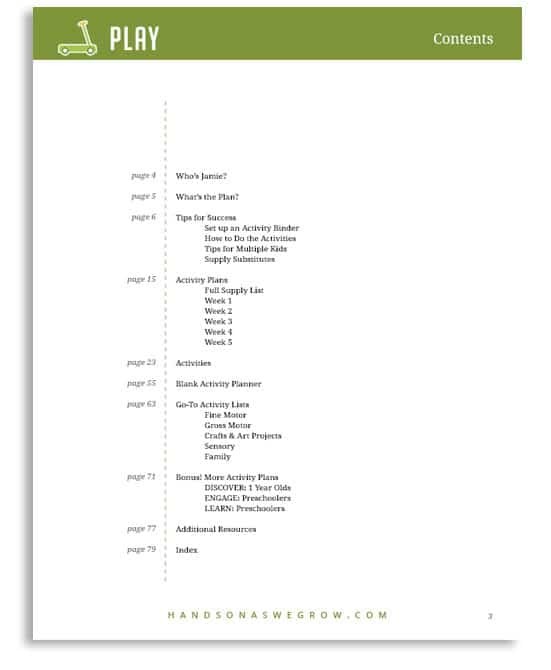 A blank weekly activity planner is included in each eBook as well to help you plan each week going forward. Don’t worry, there’s plenty of more activities included to quickly plan your weeks! Once you’ve mastered the planned weeks of activities, keep the fun rolling with the blank weekly activity planner on your own! 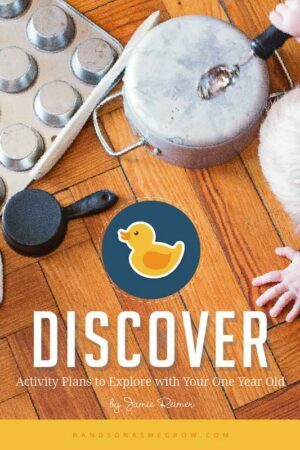 Head to the resource section full of every kind of activity you’re looking for to find ideas to fill it! 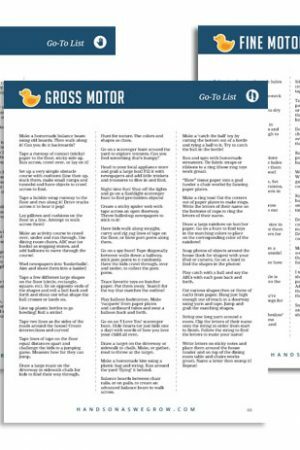 While the five weeks of activities are the heart of the eBooks, the Go-To Lists are my favorite. 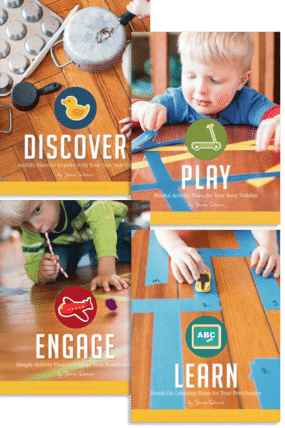 They’re lists of all the different types of activities (there’s 5 of these lists total in the set of books) with literally over 100 activities for all the ages to do! These are great activities to substitute during the five weeks if you don’t have something on hand (which is unlikely since the supplies are all very common) or to use in your activity planning going forward. Forget the hours of trying to find an activity with supplies you have. 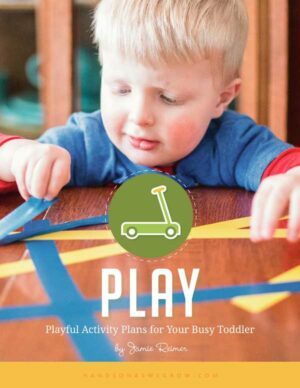 Don’t waste your time trying to decide if the activity is suitable for your two year old. Make is super easy to have fun with your toddler and be the parent you keep dreaming you will be. 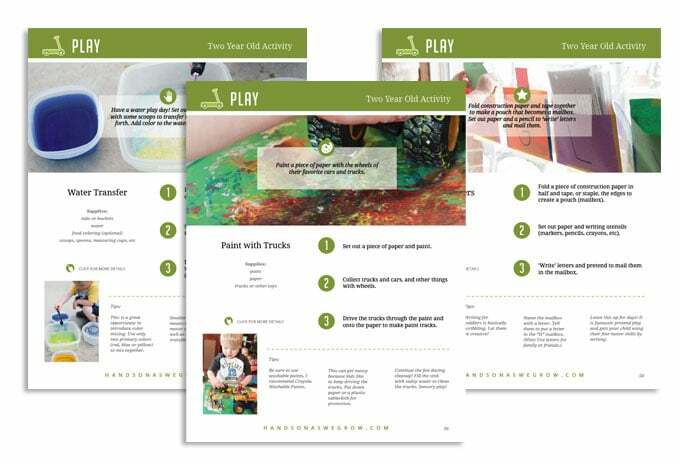 These activity plans really help parents, just like you, find fun to do with their kids! 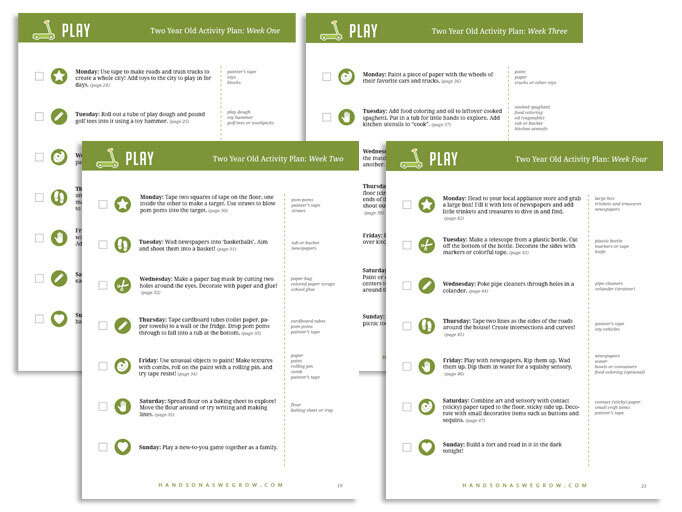 Play Activity Plans Format: PDF download, 8.5″ x 11″, 81 pages Method of Delivery: You will receive an email with a link to download the PDF. 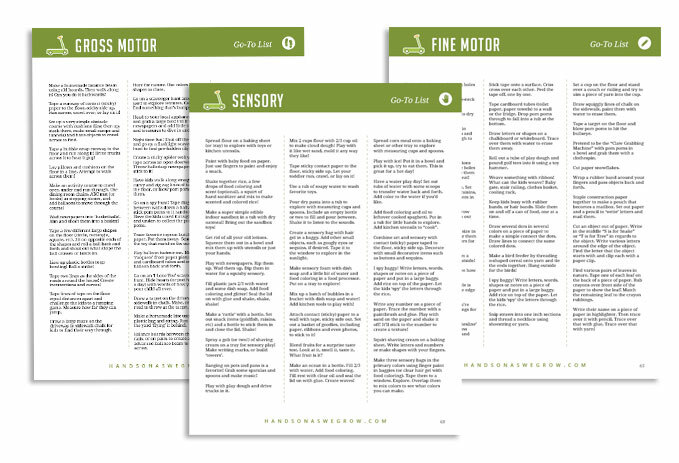 There is a full eBook PDF as well as another PDF of just the printables that you can print at home (or keep a copy on your phone or tablet for handy ideas). Can I see a sample of one of the pages? 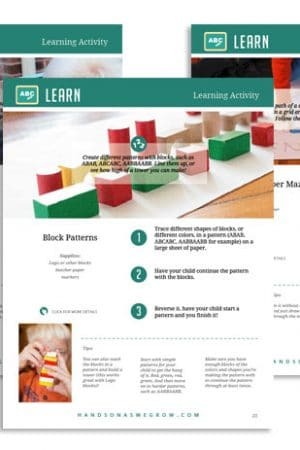 You can see samples weeks of weekly activity plans here. Can I return the eBook? The eBooks are a digital download, no, you cannot actually ‘return’ it. But I do offer a 14-day money back guarantee. With a 14-day money back guarantee you can purchase the eBook today. If you find it isn’t a right for you, you get your money back. Is this site secure? Yep! Look for the “Secure” lock in your browser web address bar. How do I open the eBooks? The eBooks are in PDF format, you will need Adobe Reader to open them (download it here). Can you mail me the activity plans? These weekly activity plans are in digital format. 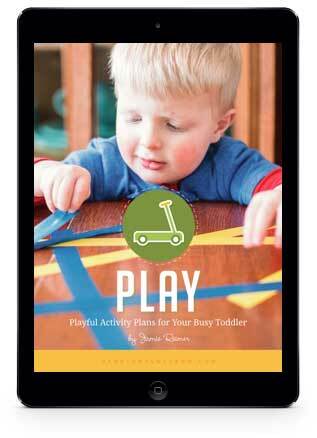 You can also purchase a physical print version of PLAY on Amazon here.